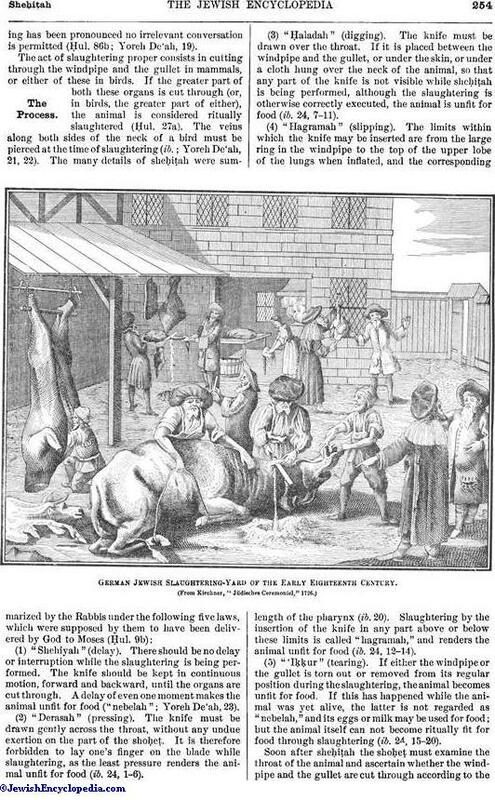 The ritual slaughtering of animals. While the practise that prevailed among the nations of antiquity other than the Hebrews, of cutting off a limb from a living animal and eating it, is condemned in several passages in the Bible (see Cruelty to Animals; Dietary Laws), no definite mode of slaughter is prescribed. In connection with the preparation of an animal for sacrifice the term "shaḥaṭ" is used (Lev. i. 5, 11; iii. 2, 8, 13); but this denotes merely that the animal is to be killed, and not how it is to be slaughtered. There can be but little doubt, however, that in slaughtering the sacrificial animals the priests followed some uniform mode akin to that which was later adopted by all Israel and which is known as "sheḥiṭah" (see Sifre to Deut. xii. 21). 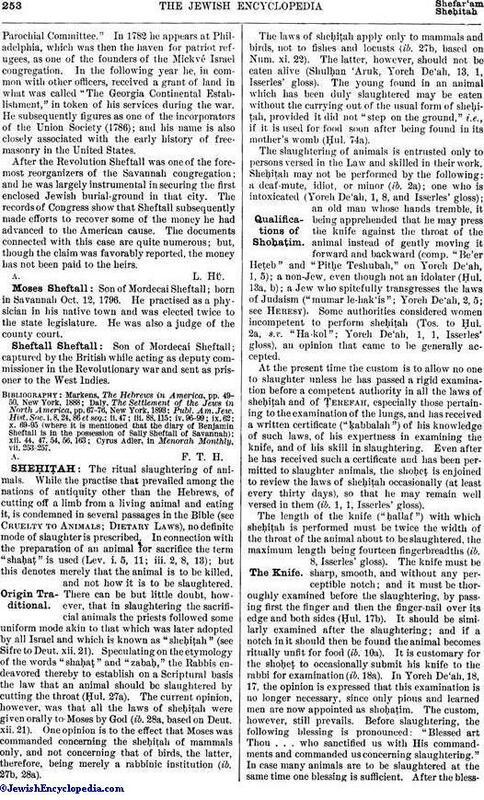 Speculating on the etymology of the words "shaḥaṭ" and "zabaḥ," the Rabbis endeavored thereby to establish on a Scriptural basis the law that an animal should be slaughtered by cutting the throat (Ḥul. 27a). The current opinion, however, was that all the laws of sheḥiṭah were given orally to Moses by God (ib. 28a, based on Deut. xii. 21). One opinion is to the effect that Moses was commanded concerning the sheḥiṭah of mammals only, and not concerning that of birds, the latter, therefore, being merely a rabbinic institution (ib. 27b, 28a). The laws of sheḥiṭah apply only to mammals and birds, not to fishes and locusts (ib. 27b, based on Num. xi. 22). The latter, however, should not be eaten alive (Shulḥan 'Aruk, Yoreh De'ah, 13, 1, Isserles' gloss). The young found in an animal which has been duly slaughtered may be eaten without the carrying out of the usual form of sheḥiṭah, provided it did not "step on the ground," i.e., if it is used for food soon after being found in its mother's womb (Ḥul. 74a). The slaughtering of animals is entrusted only to persons versed in the Law and skilled in their work. Sheḥiṭah may not be performed by the following: a deaf-mute, idiot, or minor (ib. 2a); one who is intoxicated (Yoreh De'ah, 1, 8, and Isserles' gloss); an old man whose hands tremble, it being apprehended that he may press the knife against the throat of the animal instead of gently moving it forward and backward (comp. "Be'er Heṭeb" and "Pitḥe Teshubah," on Yoreh De'ah, 1, 5); a non-Jew, even though not an idolater (Ḥul. 13a, b); a Jew who spitefully transgresses the laws of Judaism ("mumar le-hak'is"; Yoreh De'ah, 2, 5; see Heresy). Some authorities considered women incompetent to perform sheḥiṭah (Tos. to Ḥul. 2a, s.v. "Ha-kol"; Yoreh De'ah, 1, 1, Isserles' gloss), an opinion that came to be generally accepted. At the present time the custom is to allow no one to slaughter unless he has passed a rigid examination before a competent authority in all the laws of sheḥiṭah and of Ṭerefah, especially those pertaining to the examination of the lungs, and has received a written certificate ("ḳabbalah") of his knowledge of such laws, of his expertness in examining the knife, and of his skill in slaughtering. Even after he has received such a certificate and has been permitted to slaughter animals, the shoḥeṭ is enjoined to review the laws of sheḥiṭah occasionally (at least every thirty days), so that he may remain well versed in them (ib. 1, 1, Isserless' gloss). The length of the knife ("ḥallaf") with which sheḥiṭah is performed must be twice the width of the throat of the animal about to be slaughtered, the maximum length being fourteen fingerbreadths (ib. 8, Isserles' gloss). The knife must be sharp, smooth, and without any perceptible notch; and it must be thoroughly examined before the slaughtering, by passing first the finger and then the finger-nail over its edge and both sides (Ḥul. 17b). It should be similarly examined after the slaughtering; and if a notch in it should then be found the animal becomes ritually unfit for food (ib. 10a). 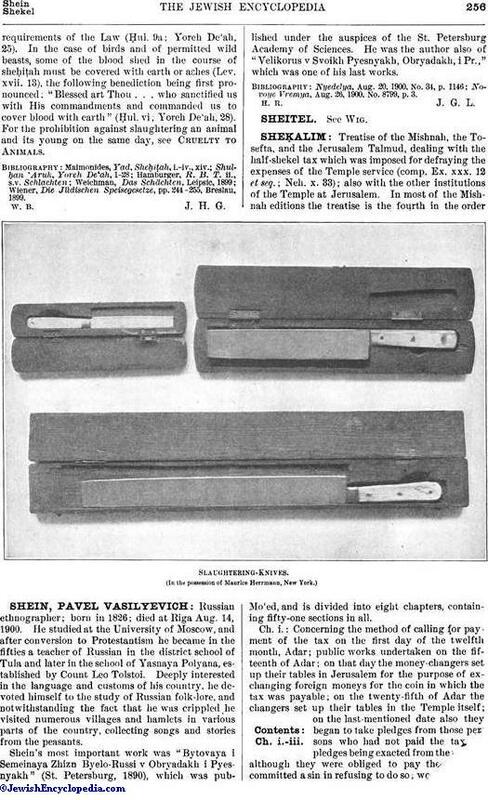 It is customary for the shoḥeṭ to occasionally submit his knife to the rabbi for examination (ib. 18a). In Yoreh De'ah, 18, 17, the opinion is expressed that this examination is no longer necessary, since only pious and learned men are now appointed as shoḥaṭim. The custom, however, still prevails. Before slaughtering, the following blessing is pronounced: "Blessed art Thou . . . who sanctified us with His commandments and commanded us concerning slaughtering." In case many animals are to be slaughtered at the same time one blessing is sufficient. After the blessinghas been pronounced no irrelevant conversation is permitted (Ḥul. 86b; Yoreh De'ah, 19). (1) "Shehiyah" (delay). There should be no delay or interruption while the slaughtering is being performed. The knife should be kept in continuous motion, forward and backward, until the organs are cut through. A delay of even one moment makes the animal unfit for food ("nebelah"; Yoreh De'ah, 23). (2) "Derasah" (pressing). The knife must be drawn gently across the throat, without any undue exertion on the part of the shoḥeṭ. It is therefore forbidden to lay one's finger on the blade while slaughtering, as the least pressure renders the animal unfit for food (ib. 24, 1-6). (3) "Ḥaladah" (digging). The knife must be drawn over the throat. If it is placed between the windpipe and the gullet, or under the skin, or under a cloth hung over the neck of the animal, so that any part of the knife is not visible while sheḥiṭah is being performed, although the slaughtering is otherwise correctly executed, the animal is unfit for food (ib. 24, 7-11). (5) "'Iḳḳur" (tearing). If either the windpipe or the gullet is torn out or removed from its regular position during the slaughtering, the animal becomes unfit for food. If this has happened while the animal was yet alive, the latter is not regarded as "nebelah," and its eggs or milk may be used for food; but the animal itself can not become ritually fit for food through slaughtering (ib. 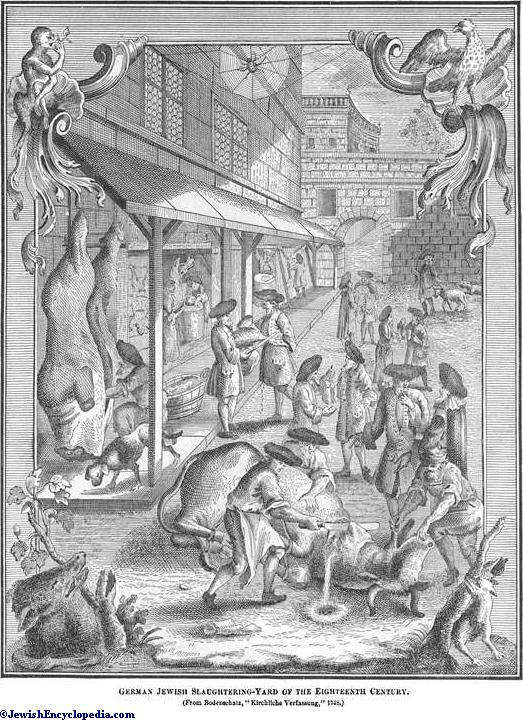 24, 15-20).V11p255001.jpgGerman Jewish Slaughtering-Yard of the Eighteenth Century. (From Bodenschatz, "Kirchliche Verfassung," 1748. )Soon after sheḥiṭah the shoḥeṭ must examine the throat of the animal and ascertain whether the wind-pipe and the gullet are cut through according to the requirements of the Law (Ḥul. 9a; Yoreh De'ah, 25). In the case of birds and of permitted wild beasts, some of the blood shed in the course of sheḥiṭah must be covered with earth or ashes (Lev. xvii. 13), the following benediction being first pronounced: "Blessed art Thou . . . who sanctified us with His commandments and commanded us to cover blood with earth" (Ḥul. vi; Yoreh De'ah, 28). For the prohibition against slaughtering an animal and its young on the same day, see Cruelty to Animals. Wiener, Die Jüdischen Speisegesetze, pp. 244-255, Breslau, 1899. W. B. J. H. G.